Janet’s Art Direction: Okay, fine, you’re an “artist”… you can paint your own cover. Gah! It’s sort of … Henri Rousseau meets a souvenir plate of Arizona meets Zaphod Beeblebrox. That makes me think of Bill and Ted! Chicks dig guys with two heads. He’s also rocking a book, so the girls know he’s the sensitive type, and a loin cloth, the better to show off his manly thicket of chest hair. Looking at the author’s website, this cover isn’t by her – her sketches are much more convincing, really rather good in fact, and her style entirely different. The ISFDB says the artist is Gerald Luxton. The other books in the series have a different cover artist – I wonder why . . .
And today’s word is “dicephalous”. Meaning possessing two heads, not meaning possessing legs too short, missus. Looks like the moon has been colonized by Percival Lowells’ Martians. And which direction is the light supposed to be coming from? The shading looks impossible. Watch out, Moonfall! Put on your hard hats! Is that a syringe sticking into the back of the thigh of old two-face? That could explain his sedate-ness. Something about the layout makes “Heather Spears” look like “Heathers Pears”. The books must contain the most amazing visions and settings… but if you show them on the cover, the slightest misjudgment will make said visions and settings seem pathetic. Ah, good old Moonfall! Lead-singer (pictured): Mark E. Moonsmith. Little known fact: the Sea of Tranquility was once filled with Mountain Dew. You know, he looks less to me like a guy with two heads then a guy doing a double-take. Have no fear, Martin Landau is on the moon and will do something about this. Hey! This guy’s a fakIr. @B. Chiclitz – Cheeky comment. So that makes three moons on the cover. @Raoul: Well, you know me—always making with the cracks. 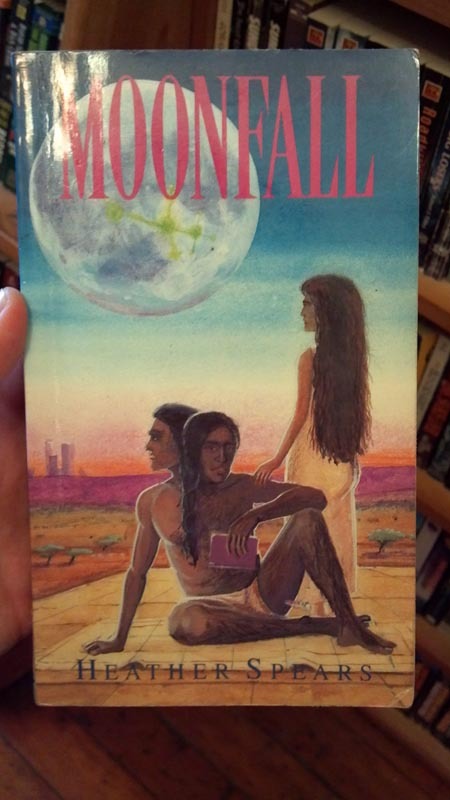 So I guess the title should be Moonfull. Ray Milland and Rosey Grier never had this problem. The next Star Wars movie…The Deathstar comes and blows up another desert-type planet. Zaphod looks pretty damn calm for someone who’s about to be wiped out when the Moon Falls. Is he/they doing the “cool guys don’t look at explosions” thing to impress the girl? Depending on how long it takes to fall, that might not matter. If it’s happening quick, go ahead and stare at it, dude. @THX: Like Ray and Rosie, this guy appears to be of two different races. Or at least half of him never gets a suntan. @fred: If Landau’s in charge, the moon will go in the opposite direction. Wonder if the sequel was titled “Moon Exit”. @Tag: Does she deserve the Sir Mix tag?